It's the coolest place in town! This 4,000 sq. 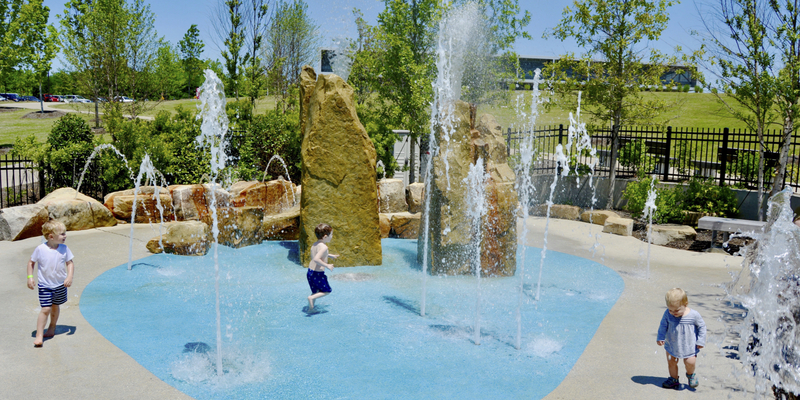 ft. play space features great splashing opportunities for kids, including a water tunnel, multiple interactive spray jets, water pumps and geyser boulders. Visit Hyde Lake Boat House to purchase wristbands. 10 and under | Children ages 3 and under must be accompanied in the play area by a parent/guardian who is 17 or older, and the parent must purchase a wristband to enter the Sprayground. Water Play sessions are 50 minutes of water play time. Sessions start at the top of the hour. Water Play session capacity is limited to 45 children per session. Group reservations are available. Please contact Dirk Kitterlin at dkitterlin@shelbyfarmspark.org for more information on groups of 15 or more. Group rentals are not available from 1pm-7pm on Wednesdays. For birthday party package information, please click here. The Water Play Sprayground is handicap accessible. If your child needs special accommodations, please contact Dirk Kitterlin at dkitterlin@shelbyfarmspark.org. Play it safe! Check out the Water Play Sprayground rules here.